I packed flip-flops for an early spring work trip to the desert southwest, figuring they were a little better looking than my beloved Crocs. But once I landed I kicked myself. No, it wasn't because the denizens of the desert southwest had suddenly decided Crocs are cool and I was the odd woman out. I was because I was daydreaming about the backpacking trip I had planned at the end of the work week and remembered that Crocs are the best camp shoes. I'd have to go backpacking with my flip-flops. Tugging off hiking boots at the end of a long, hot day only to stuff my feet into the criss-cross straps of my flip-flops, my feet exposed to the detritus of the natural world and possibly biting insects, was not ideal. So I was not terribly devastated when, three hours after work was over and I'd driven away toward the weekend, I realized I'd left the flip-flops behind. Call it fate or subliminal, but it seemed to me that this was the perfect time to score myself a new pair of Crocs. I first met Crocs during their brief heyday in New York City. 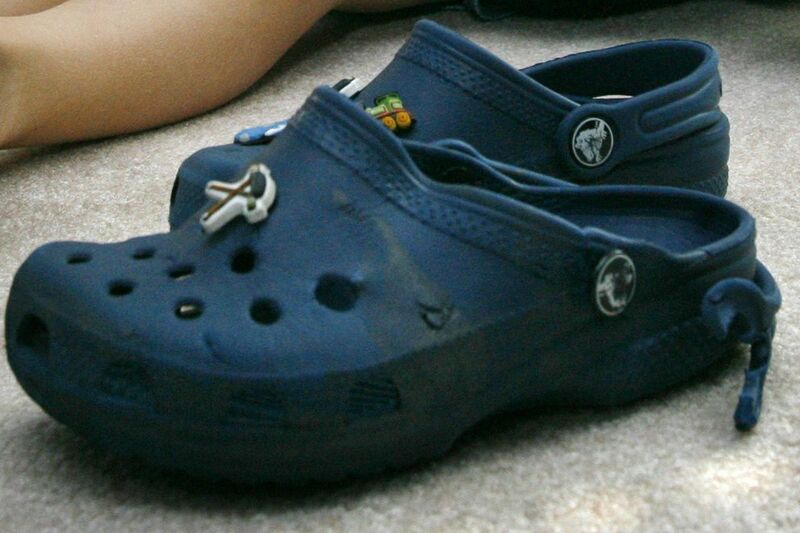 Some people say that "Crocs" and "heyday" do not belong in the same sentence. Those are the same people that call Crocs things like "devil spawn," "blasphemic" or "ugly." Perhaps these people deny that Crocs ever made it to the ever-fashionable isle of Manhattan. But I was working at my desk job one day when a woman in bright orange Crocs paraded into the office, and while I can't say it was love at first sight, they certainly made an impression. I was fascinated by them. They were, indeed, ugly. They were so ugly (and this particular pair was so orange) that I found myself transfixed. What were these shoes? Why would you wear them? What swagger would I need to possess to pull off a pair of Crocs, and could I ever be that confident? When I encountered my first entire wall of Crocs flooding a shoe store in a plastic, punch-holed rainbow, I knew I had to try on a pair. I slipped my feet into an emerald-colored shoe. And just like that, the plastic shroud encased my feet, and my heels sank gratefully into the cushiony, slightly textured-with-the-tiniest-massaging-pebbles, sole. Crocs became beautiful to me. I wasn't alone. The shoes were everywhere. There were even knockoffs. George W. Bush famously wore a pair of Crocs, and the internet derided him for it like it was 2018. I wore mine for years until the soles wore through. In 2008, I bought another pair. They were baby blue. These were the Crocs I left behind in Alaska during my trip to the southwest. These Crocs backpacked with me through mountains across Alaska, Nevada and Utah. When the heel straps eventually broke off, I'd loop a piece of line through the holes and firmly affix them to the outside of my pack. The soles wore thin and sharp rocks could hurt my feet. Still, I kept my Crocs. I'm not a fan of landfills any more than the next person. I could see my poor baby-blue Crocs swimming their way toward the Pacific gyre, and I figured they could last another day, another backpacking trip. It was with all of this in mind that I set out to find a new pair of Crocs while in the Southwest. I realized that I hadn't seen them in many stores recently, so I figured I should make a few calls before I got in the car. I called one shoe store. No Crocs. Another — the same. Five shoe stores later, I felt discouraged. Finally, I called a sports store that sold Crocs. When I showed up, they only had three colors — baby pink, camouflage and black. Nothing against wearing baby colors or making your feet invisible, but I chose black. Perhaps this was a fitting tribute to the standard uniform of Manhattanites, where I'd met my first Crocs. Or a nod to the flip-flops I'd left behind, also black. When I tried them on, I realized how old and worn out my baby blues truly were. The new Crocs didn't have creases or paint splatters, they had both heel straps, and they didn't invite every prickly thing I walked on to stab through to my heel. Now, back in Alaska, I still have my old Crocs (to the delight of my husband, who has never once suggested the Crocs might be lost in a move, or thrown from a bridge). These are now my inside Crocs. My new black ones spend lots of time with me in the garden. They get hauled up mountains. I pull them on to cross glacial streams. I'm far from New York City now, but feel I have found my stride in Crocs. We are doing exactly what we were meant to do. That confidence I wanted, back in New York City? Crocs helped me get there. After all, not just anyone can rock an ugly shoe like that.